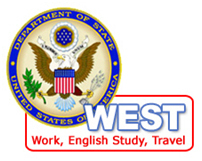 In 2009 April, KUSCO was designated by the US State department as J-1 exchange visa sponsor for the WEST program. The WEST program is an innovative exchange program developed by the presidents of the United States and Korea, and created by a memorandum of understanding between Secretary of State of the United States and Foreign Minister of the Republic of Korea in 2008. The program allows qualified university students and recent university graduates from Korea to enter the United States for a period up to 18 months on J-1 exchange visitor visas, to study English, participate in internship, and travel independently. The mission of KUSCO is “to foster the US-Korea Science and Technology Exchange” in the areas of “Policy”, “Research”, and “Education.” The WEST program is also established to globalize young Koreans in the format of education and cultural exchange. The entrance of KUSCO into the international exchange field in a prominent position will allow KUSCO to expand its influence and become a major player in matters relating to Korea-U.S. exchange activities, particularly in the S&T field. In 2008, Ministry of Education, Science and Technology (MEST) of S.Korea initiated the national project called “World” Class University (WCU)” continuing to 2012 with an annual budget of $16.5M ($825M). WCU was designed to meet Korea’s critical need to foster research in Key growth-generating fields, and to ensure quality in the development of next-generation human resources. For the first round, more than 45 Korean universities participated with 140 different proposals and KUSCO conducted the review process under the auspices of MEST. Beginning of 2008, April KUSCO initiated funding program for Korean-American Young Generation through National Mathematics and Science Competition (NMSC). Every year, students from 4th to 11th grade can participate in this competition and is taken place nationwide. NMSC is designed to demonstrate and teach the importance of science and engineering to the new generation of Korean-American students and to promote their interest in mathematics and careers in the fields of science and engineering. Former minister of Science and Technology (Currently, Ministry of Education, Science and Technology) and deputy prime minister of S.Korea, Woo-Sik Kim, visited KUSCO during August, 2007 to discuss about how to expand the KUSCO’s role as cooperation center between Korea and U.S. Since 2006, KUSCO was designated as one of hosting members for UKC program along with Korean-American Scientists Engineers Association (KSEA) and Korean Federation of Science and Technology Societies (KOFST). Through the UKC hosting member, KUSCO was acknowledged as a science organization to play a vital role enhancing and strengthening bilateral S&T relationship between U.S. and Korea.